Given the tremendous impact of sales enablement tools on sales performance, we’ve decided to share our experience in SugarCRM development for sales enablement purposes to find out if the end justifies the means. Why Customize SugarCRM for Sales Enablement? Firstly, let’s take a look when such SugarCRM customization makes sense. It is an open secret that there is always a lack of qualified sales managers, therefore sales enablement tools are going upscale as they help reproduce best practices and boost sales team performance. It’s also not a secret that best practices are created based on experience, require much effort and time from best sales men and change with time. SugarCRM is in and of itself a powerful sales enablement tool, but it may not be efficient enough when it comes to best practices reproduction. In turn, this can be solved by simple SugarCRM development. How exactly? How to Customize SugarCRM for Sales Enablement? It should be noted that a company which is going to implement sales enablement tools will face the challenges that may be called “diversity” and “flexibility”. Firstly, there may be a great deal of such practices since a company can sell various products of different domains to diverse customer categories. Consequently, it is imperative to create the conditions which will allow managers to remember effortlessly all necessary templates. Secondly, one should bear in mind that in our constantly changing world an “engine” can become an “anchor” as time goes by. Therefore, a manager should get a possibility to do his/her job in a creative way, adjusting best practices to a particular deal, but at the same time have control over the adjustments. We found the solution to the problem by customizing SugarCRM with a “check list” module that extends standard SugarCRM capabilities. The idea is simple: to bind best set work practice (“check lists”) with key marketing and sales entities (Leads and Opportunities), based on the customer and deal parameters; also to provide a possibility to accumulate and study new experience by transforming “check lists”. 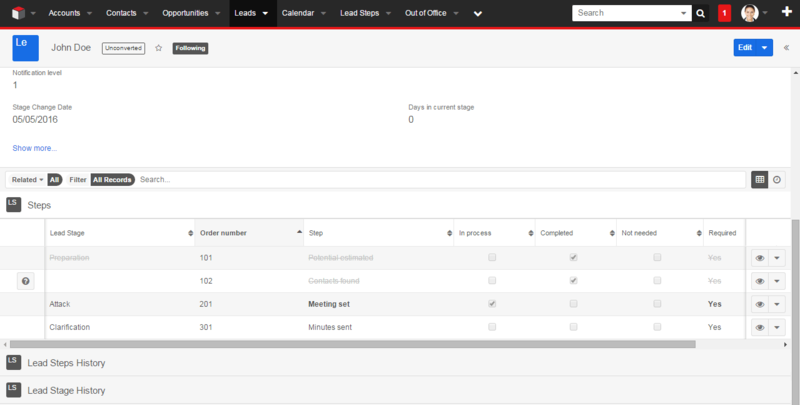 Below are SugarCRM screenshots that illustrate the “diversity” and “flexibility” concepts inherent to sales enablement tools in work: the first one demonstrates the possibility to set opportunity templates according to different domains; the second screenshot shows the template application, including the list of required and non-required steps that are needed to be taken to close a deal, which allows the sales man, especially a not experienced one, to remember recommended and required action at each stage, and managers receive timely and relevant sales pipeline reports. To simplify the users’ work, the tools were designed in such a way that the non-required steps can be skipped; there is a possibility to return to the previous stages and to register work execution on a current stage in a timely manner. Moreover, the tool is provided with an automatic reporting system, which notifies managers in case if any request has not been assigned to processing or completed in time. “Should the sales enablement tools be implemented or not” is a question which requires a careful and well-considered approach. Companies invest large amounts of money into sales enablement tools that is why it is important that the end justifies the means. Control over timely execution of tasks. Our personal experience of such SugarCRM customization at CityAds Media, an international affiliate marketing and performance advertising platform, was positive indeed: the enhancement allowed the company to improve sales team performance on a tight schedule and to enlarge its business footprint faster. If you are interested in customizing SugarCRM, but have doubts how to make it better – do not hesitate to contact us, we will be glad to help.